Hair removal is a daily chore you can cross off your list when you decide to undergo laser hair removal. Peter Newen, MD, and the team at The Image Center provide laser treatment that permanently eliminates your unwanted hair and is safe for every skin type. If you’re ready to be done with shaving, waxing, and tweezing, book an appointment online or call the office in Huntington Beach, California. Lasers can safely eliminate unwanted hair — without harming the surrounding skin and tissues — when the laser operates at a wavelength that’s only absorbed by colored pigments in the hair follicles. 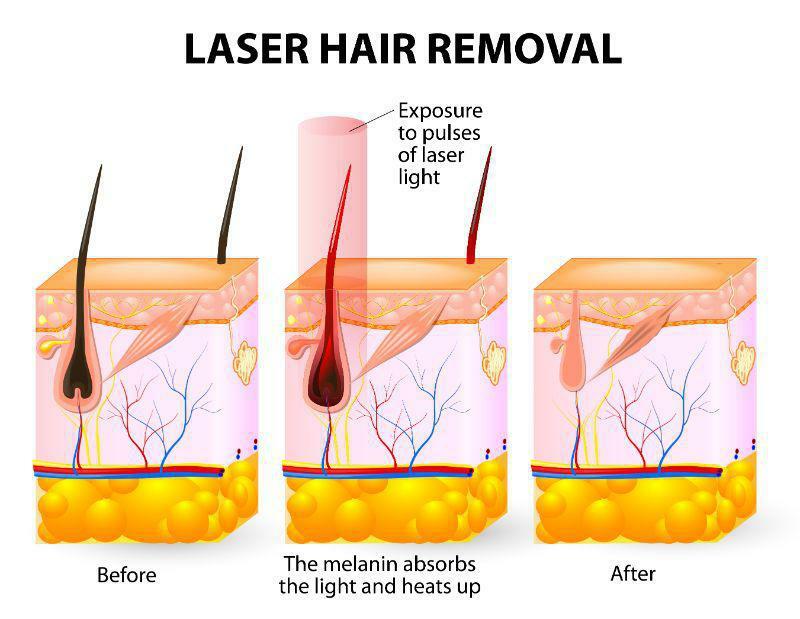 As the laser passes safely through your skin, it’s absorbed by the hair follicles, and the laser’s heat destroys the follicles. As a result, the existing hairs fall out and the follicles stop growing hair. Why do I need several sessions for laser hair removal? You’ll need a series of laser treatments to remove all your unwanted hair because the laser can only destroy follicles when they’re in a growth stage. Hair follicles go through three stages. They actively grow hair for years, then they go through a brief transitional stage before entering a rest phase. While the follicle rests, the existing hair loosens and falls out. That’s why you naturally lose hair every day. After a few dormant months, the follicle cycles back to a growth stage and produces new hair. Hair follicles follow their own timing. On any given day, about 10-15% of them are resting, but they return to a growth cycle at varying times. In order to catch all your hairs while they’re growing, you’ll need 2-6 treatments spaced about 1-4 months apart. When you come in for a consultation, your provider at The Image Center can tell you how long your hair removal session will last. If you’re treating a small area, each session may only take a few minutes. A larger body area, like your back or legs, may take 30-60 minutes. Many patients describe laser hair removal as feeling like a rubber band is being snapped against their skin. While many tolerate the procedure, others prefer to use a topical numbing cream to stay comfortable. Expect your skin to be slightly red after your procedure. You may also experience minor swelling. However, these side effects won’t last long and you don’t need to take downtime. You can get back to your normal activities, but it’s essential to protect the treated area from sunlight. If you’re tired of the daily shaving routine, schedule an appointment by calling The Image Center or using the online booking feature.